Access to the Museum Michigan Avenue Entrance Ramp access is available, but drop-offs are not permitted. Modern Wing Entrance Ramp access is available, and drop-offs are permitted. A traffic pullout is available from the eastbound lanes of Monroe Street. Wheelchair Assistance Members who would like assistance getting to and from member events using museum-owned wheelchairs may make an appointment by e-mailing access@artic.edu. Please make an appointment one to two weeks in advance of your visit. Questions? Please call (312) 443-3600 or TDD/TTY 312-443-3680 weekdays 9:00–5:00. Parking Accessible parking is located in the following garages near the Art Institute. Please note that they no longer accept over-sized vans. Millennium Park garage (enter at Columbus Drive and Monroe Street), with 6' 8' clearance in some sections and an elevator at the exit East Monroe Street garage (enter at Columbus Drive and Monroe Street), with 6' 8" clearance and exit ramps at Monroe Street Grant Park North garage (enter at Michigan Avenue between Madison and Randolph), with 6' 6" clearance for vans and an elevator at the exit Inside the Museum Elevators are located throughout the museum with access to all floors. A limited number of wheelchairs and strollers are available for free on a first-come, first-served basis. Pay telephones have volume control and are positioned at an accessible height. A TDD/TTY–equipped phone is available in the Michigan Avenue lobby. Auditoriums are equipped with designated wheelchair areas. 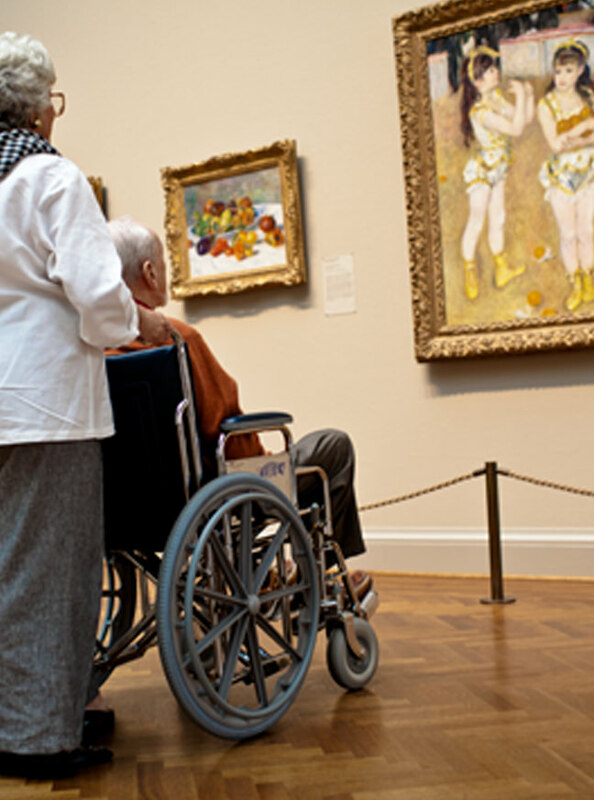 Mobility Devices Wheelchairs are allowed in all areas of the museum. These devices include manual or electric single seat chairs, electric mobility seated scooters and knee scooters, and other manually operated mobility devices including walkers, crutches, canes, braces, and other similar devices. Manually operated wheelchairs are available free of charge at coat check areas on a first-come, first-served basis. Advance reservations are not available.